As far as my biggest goal of this year is coming along, phase 1 of my second novel’s outlining is underway. And by underway, I mean that I am taking notes, and have been- albeit slowly- for the past six months. They’ve been collecting in various notebooks, scraps of paper, phone apps, and, of course, my head. And now I’ve taken to transcribing them onto my computer. After several days, I have managed to collect them into one massive document of 10,000 words. It’s full of character ideas, random excerpts, notes-to-self, and a lot more. Now I’m going to begin making a character bible, a big document describing the characters in detail, to refer back to at later points. I’m going to have to sift through all of the notes I have so far and pick out what I would actually like to use. Then I’ll build off of what I have with more ideas. My first novel was very plot-driven and all of the characters were two-dimensional. So this time I’m trying to focus on developing characters first, and then plot. To learn more about this I’m reading Characters, Emotion & Viewpoint by Nancy Kress. Although I’m a little late- January’s almost over- I figured I would make a list of some of the goals I hope to accomplish this year. I won’t call them “resolutions,” because something about that word makes it a little intimidating, so for now I’ll just call them “goals”. This is a huge goal for me, in terms of both size and importance. I’ve been developing a new story idea slowly, for the last six months, and I’m itching to get it down on paper and into a full-blown novel. This will also be a big step in improving my writing skills and getting a little closer to my dream of one day being published. Of course, even that looks much simpler than the actual process. But the main idea for me is to just keep moving, even if it’s slowly. One challenge is going to be balancing schoolwork, extracurriculars, and everything else with writing. I’m going to try to put aside time every day for a little bit of work and see where it goes from there. Overall, I’m going to try to practice very often since that’s the only way I know to improve. I’d also like to produce some standalone works. This is a goal I’ve been working on for a number of months already, but I’d like to keep developing the skills. I started learning in the first place because I am half-Norwegian and visit the country every other year or so. I have a lot of family there that I’d like to be able to speak with, so the skill would come in handy. I also just think it’s fun to learn a new language anyway. If you want to learn a new language, I’d highly recommend Duolingo! It’s free and very fun and easy to use. I’m using it every day to learn Norwegian. I’d like to learn how to play guitar and am planning on taking some lessons. Hey everyone! In order to motivate myself to experiment and do creative things this summer, I’ve created a bucket list of random activities and goals that I hope to accomplish come September. This is definitely the biggest goal on my list. I really want to improve my writing, and the only way I know how is by practicing. Plus, I already have a rough idea for a story that is begging to be told! This goal ties in with one of my biggest life-goals: to be published. I decided to abandon my first novel because I consider it more of a learning experience than a project I want to pursue in the long-term. So I’m going to work on a new project that I can really put my all into for the coming months and- who knows?- years. Painting “en plein air” basically means painting outside. It’s done in the light of day, with the subject actually in front of you. This is something that has interested me for a really long time. I haven’t gotten around to trying it, though. This summer I want to learn how to paint outside with oils and hopefully improve my painting skill in general. I love reading, but it always seems to be on the bottom of my list of things to-do even when I have free time. I think reading will help me be a better writer as well, so I am making it a top-priority. I really love the way watercolor paintings look, with their subdued colors and softness. I admire the way some artists can use layers of watercolor to create atmosphere and depth. 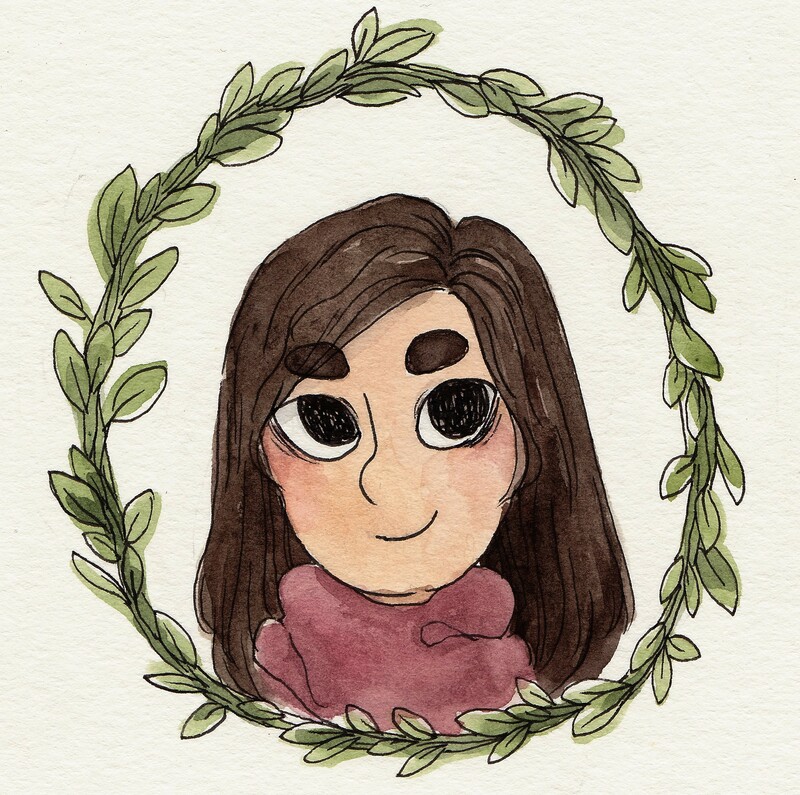 I’m going to practice watercoloring in order to hopefully learn some of these techniques and improve in general. This goal has popped up pretty recently for me. I’ve been drawing for a long, long time, but in the past few years my artistic aims have shifted immeasurably. I started drawing characters and illustrating a few years ago, and now I’d like to begin developing a unique illustration style. Zines are something I’ve discovered pretty recently and have fallen in love with. I still don’t quite understand them, but I think they usually feature art, writing, or both in a booklet made of printer paper or any other type of material you can think of. The endless amount of possibilities that come with zines really excite me! On July 18, I will be heading to Norway for a two-and-a-half week trip! I’ll attempt to document it through art-journaling, painting, drawing, and photography. Yay! 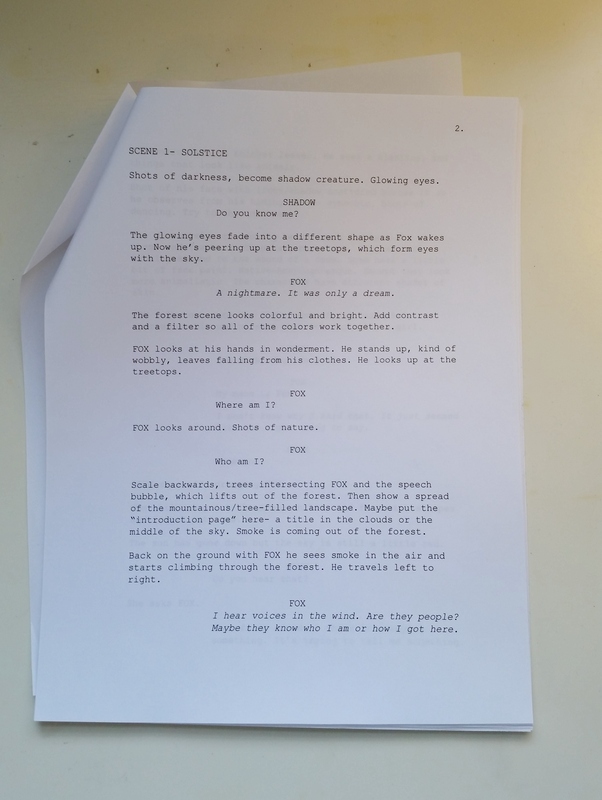 I just finished writing and typing up the script for Solstice! It was challenging but I finally sat down and banged it out on my mini legal pad. I love mini things. They’re so cute and non-intimidating. I’m so excited because I can see the story coming together and I can imagine what the finished book will be like. The script is 13 pages and about 1600 words long. It doesn’t seem like a lot, especially when compared to that of a written novel, but I’m pretty sure that it will become about 60-90 pages of illustration. The book isn’t going to be text heavy, so I think that number makes sense. There will be a couple scenes that don’t use any text. I don’t know about you but I love printing out writing and holding the stack of paper in my hands. It’s a nice feeling, especially if you’ve been working digitally for a while. The script is not exactly finished, as I need to edit and fix and add things, so I’ll just call it draft one. However, I don’t know how long I can edit if I want to be done by mid-May. I’ll have to speed up the process quite a bit in order to have a lot of time for creating art. From my experimental pages I can already tell that it’s going to be time-intensive. After my quick edit I’ll finish sketching thumbnail pages and working out the visual side of the story, which I’m really excited for because I love drawing. This project has been really fun so far and I’m excited for the challenges coming up next. In the spirit of challenges, I’m setting a lofty goal of finishing thumbnail sketches by the end of Saturday the 28th. I have some time off so I think there is a chance that it could happen (if I get my lazy self off the couch). We can learn a lot from rivers, I think. Story time! I wrote this a year ago for a project I made called Forest of the Mind. At dawn Skull-Man rises, shaking off sleep as the sky does the stars until a deep reddish purple fills the spaces in between treetops. 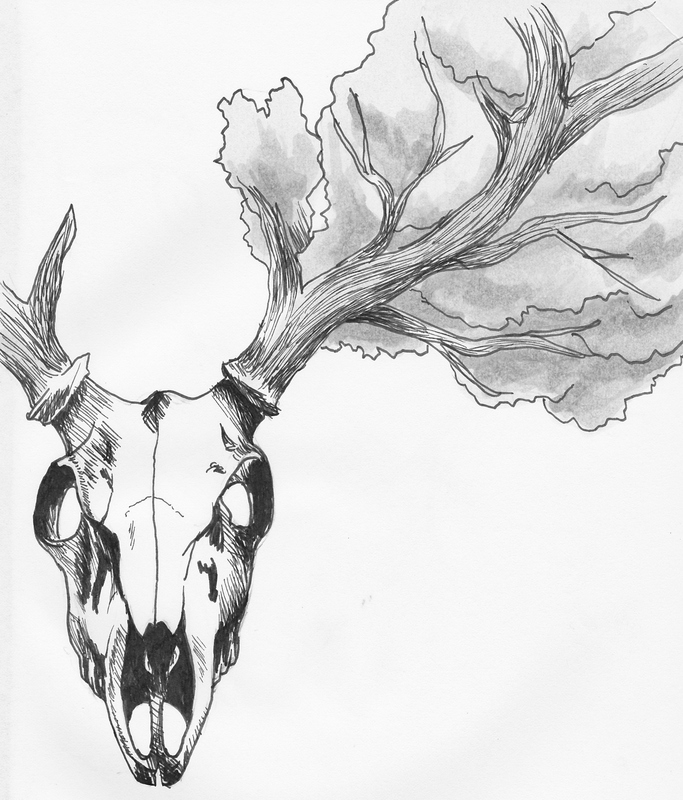 He brushes the leaves and grass from his dark, hollow eyes and antlers, standing up to full height to see his distorted shadow stretch across the ground. He sees a long figure with tendrils extending from its head, like a tree’s silhouette. Skull-Man walks, one foot silently moving in front of the other, shaded skin blending with the crumpled, decaying leaves and the gray bark of the forest. He listens as he travels, to the birds whispering sweetly to one another and the shush of trees moving in the breeze. The morning is peaceful. Skull-Man keeps walking. He rests on a rock, fingertips brushing the smooth, hard sides of his face where flesh has fled like water in a dry riverbed. He tries not to think about why he exists like this, but perhaps it is the possibility, the unknown that keeps him going. He fingers the ridges along the sides of his skull, deep, like scars. Skull-Man walks on. 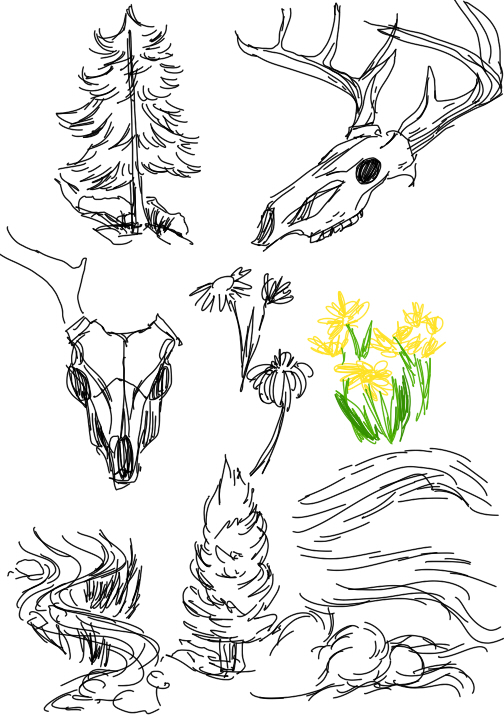 He sees wide rivers, some swift, others barely trickling, canyons, where he finds more skulls, skulls that almost match his own, mountains, pine forests, cliffs, lakes. He sees everything without knowing exactly what he is looking for yet. All he knows is that he has lost part of himself, and he must find it. In autumn he is amazed and frightened to see his left foot turn into a bony hoof. Skull-Man keeps walking, through the trees that are changing as he is. He still cannot find what he is looking for, and the dawn of every new day looks like the sunset of his last. Spiny vertebrae appear on his back, going all the way up and down, hard like bark. He cannot do anything but keep traveling, every day, as soon as a sliver of sun shows on the horizon and as late as the silver moon allows. The days grow longer and then shorter once again. Leaves fall and grow after the snow. Then the rain comes, as it always does, leaving Skull-Man huddled beneath a mossy overhang in the mist, thinking about when it will all end, arms wrapped around his knees. Yet Skull-Man keeps walking. He grows fur, starting to cover the white bone, his hands become hooves, he walks on four legs, and yet he never stops traveling, looking for remnants of his past self- memories maybe. One summer night it finally happens. The air buzzes with electricity in the coming of a storm. Warm air blows the trees and the field of grass around Skull-Man, circling him. He lifts his head one last time as a man, searching the horizon for the intangible. Something flashes across his eyes as he smells the storm in his muzzle, something like the flight of a blackbird and a hundred more behind it. Skull-Man searches no more, for he knows who he is, for he takes the earth inside of him and turns every branch, every leaf, every drop of water into a memory. 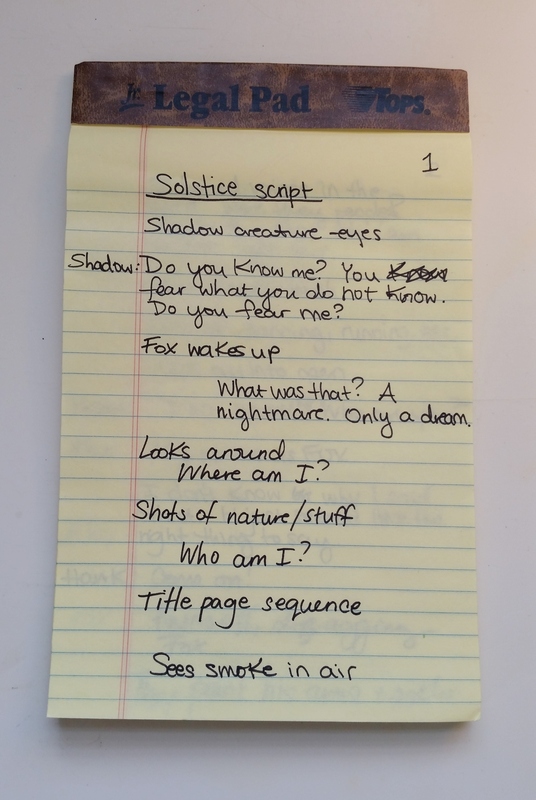 I started writing the script for Solstice and so far it’s about four pages altogether. It’s definitely been a challenge because it’s so different from prose writing and I have to concentrate on how it will work visually. Part of the challenge was finding a format to write in. 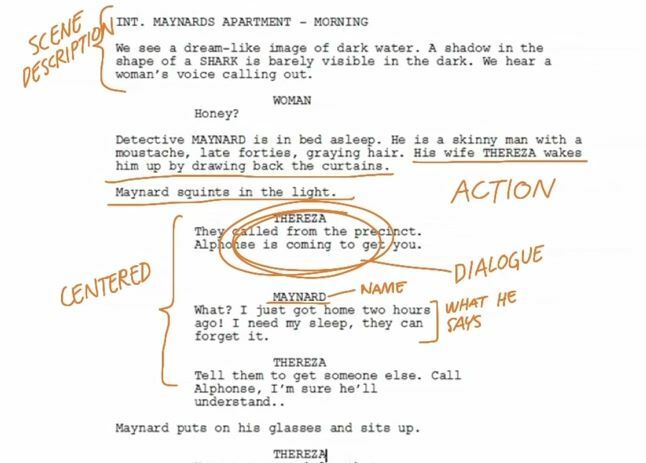 On the internet there’s a multitude of different formats, from writing the content of each panel in paragraphs to creating something that resembles a screenplay. The dialogue is in the middle of the page, with visual description and random notes to myself between it. The internal monologue I put in italics. It’s really experimental at the moment, since I’m still trying to figure this whole process out and use it to build a story. It doesn’t feel like I know what I’m doing, but that’s okay. It’s all in good fun. The deadline I’m setting for myself is a week from now- March 15. Hopefully by then I’ll be ready to start thumbnail sketches. Onwards! Basically, I’m going to split up my time into these six parts. It looks like a lot of work…and I think it’s going to be. But that won’t stop me! The good thing is that I’m pretty close to starting the actual writing. And then comes the art side of it, which I’m more unsure about. Well, that’s something I’ll tackle when the time comes. It’s all part of the adventure.